You may be wondering what an infrared wireless camera is. It is a digital video camera that can capture digital video images in total darkness and does not require a coaxial video transmission cable run from the camera to the Digital Video Recorder or DVR. Let’s start at the beginning. 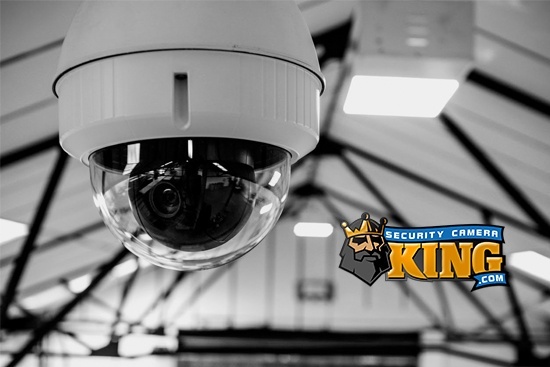 A digital video security and surveillance system normally has three basic parts or components: The camera(s); the DVR; and, the monitor(s). It’s the camera that we are interested in so lets talk about how it works and what it does. 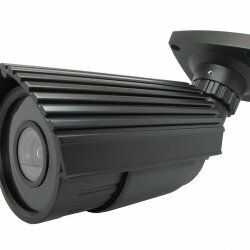 Unlike the infrared wireless cameras, most cameras need some sort of connection wire to send their video data over to the DVR. Most often, this wire is actually RG-59 coaxial cable. The signal originates at the camera end and terminates at the DVR end. There is nothing wrong with this method; in fact this is the way most security systems are set up. However, if you want to avoid running all that cable, then you may want to consider a wireless camera. The wireless camera helps to avoid all the time and effort it takes to run the RG-59 cable. Imagine that you want to install a gate camera at the end of a very long driveway. Can you imagine the cable run through your house all the way out to that camera at the gate? 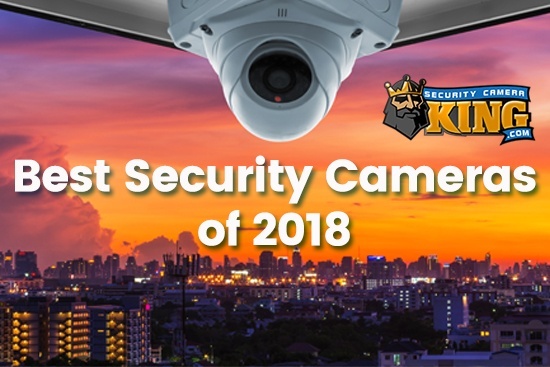 On the other hand an infrared wireless camera has its own on-board transmitter and built-in antenna so that it can send the video data to the DVR in radio frequency format instead of cable. Actually the camera sends the radio transmission to a corresponding receiver made specifically for this purpose. The receiver is then connected to the DVR by a coaxial cable and relays the camera’s signal to the DVR via this short cable. The camera at this point is not truly 100% wireless. All cameras must have some sort of power supply and so a power supply line must be run to the camera. In this situation, this can still be a bit of an advantage at making installation easy because a single plug-in type transformer, made specifically for the camera can be plugged in to an outlet nearest the camera reducing the power supplies’ cabling run. A truly infrared wireless camera can be achieved with very little effort. This is probably the most desirable configuration because there are absolutely no wires or cables that need to be run from the DVR to the camera. 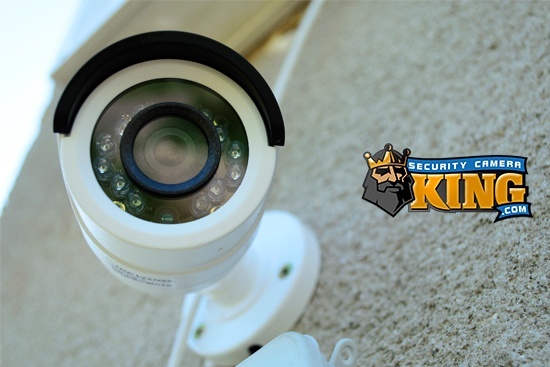 There are many infrared wireless cameras available from Security Camera King that obtain their power supply from on board batteries. This makes the camera truly wireless. When purchasing a wireless camera, make sure you know how far (usually in feet) that your camera will be separated from the receiver. Most cameras employ a wireless transmission type where the maximum range is stated based on Line Of Sight or LOS. That means that a camera with a wireless range of 300 feet has that range based on LOS. If there are any objects between the receiver and the camera you could loose the signal entirely, although this is rare. Generally, depending on the amount and material the radio signal must go through it simply reduces the camera’s range. The other half of the infrared wireless camera, that is the infrared portion, allows the camera to see in total darkness. The camera lens focuses the field of view onto a small (usually 1/4 to 1/3 inch square) sensor that when struck by light energy emits electrical impulses that can be measured and used to create an electronic reproduction, or video footage. The chips that are used are the Charged Coupled Device (CCD) and the Complementary Metal Oxide Semiconductor (CMOS). Both the CCD and the CMOS have the inherent ability to react not only to the visible light spectrum but they can also see the near red infrared light spectrum (human eyes cannot see this type of infrared radiation–simply put it is invisible to us). An infrared wireless camera is usually supplemented with an array of InfraRed Light Emitting Diodes (IR LEDs) positioned around the lens. This is like using a floodlight on a non-infrared camera. Additional illuminators can be purchased to extend the distance of the camera. An infrared wireless camera not only has a transmission range, but it also has an Infrared range distance. Make sure to check the infrared range on the camera before purchasing it as well.